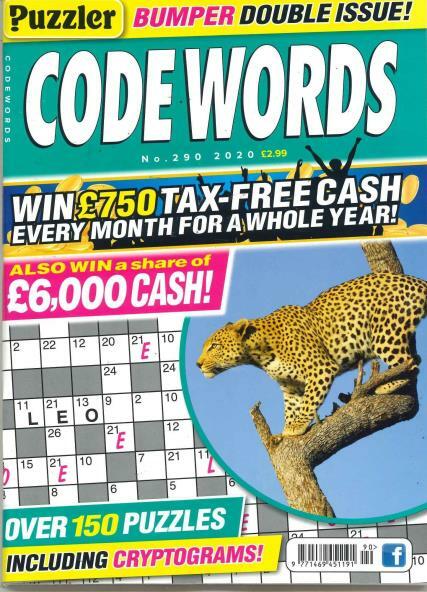 Puzzler Codewords Magazine is a monthly magazine dedicated to codeword’s. Throughout the 64 pages of Puzzler Codewords Magazine , you’ll find 75 codeword puzzles just waiting to be solved. Puzzler Codewords Magazine is a monthly magazine dedicated to codeword’s. Throughout the 64 pages of Puzzler Codewords Magazine, you’ll find 75 codeword puzzles just waiting to be solved. Each puzzle includes an interesting link to the puzzle, which can only be found once the puzzle is complete. The codeword’s vary in difficulty but are straight forward with no unusual words. Puzzler Codewords Magazine also includes cash prizes and the opportunity to contact the editor with your puzzling feedback to develop the magazine to exactly what the readers want. Crack those codewords by ordering your subscription to Puzzler Codeword Magazine today!